Apple really, really wants everything to "just work" and when it does, it's fantastic. When it only nearly does, it's bewildering. Such as right now when there is music on your Apple Watch but you can't be sure where it's coming from -- or why you can't actually hear it. Say your Apple Watch is on Wi-Fi but for some reason your iPhone isn't. Maybe you've forgotten to switch off Airplane Mode or maybe the battery has run out. 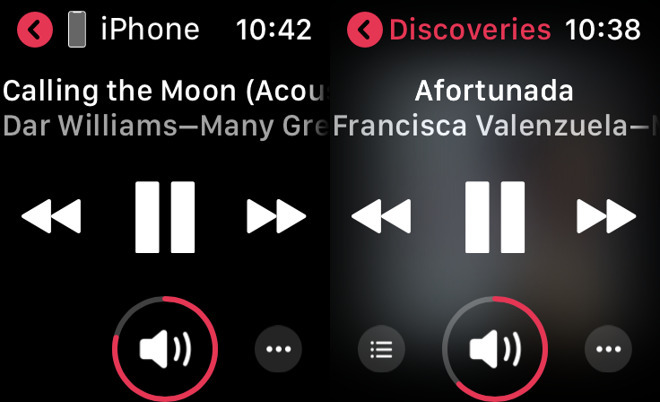 Siri on the Apple Watch will still request the music you ask for from Apple Music. It will find that music and act in every way as if it were going to play it, but it stops. 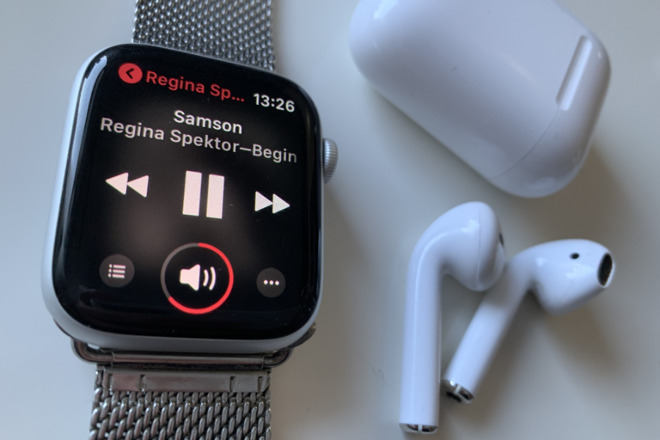 Despite having found the track over its own Wi-Fi connection, the Watch is asking the iPhone to play it -- and the iPhone's Wi-Fi is off. There's more, though. You can also get to Now Playing via the Apple Watch Music app -- but it's a different Now Playing. 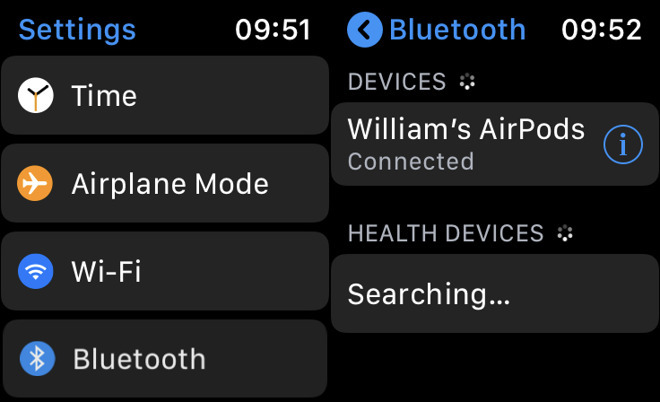 Apple Watch connected via Bluetooth to the vehicle. I raise my wrist and ask Siri to play music...and it sends it through the iPhone in my pocket! Yes, when Apple tech works the way they promise it will, life is good. When it doesn't (which is very often given the complexity of it all), I'm sometimes tempted to go back to the RAZR and simplify my life. It's great that you get it, but we've been asked by myriad people to cover the how and the why. AppleInsider is for everybody, including those new to the ecosystem. Is that a real use case? Why would your watch be paired with the vehicle system when your iPhone is present? Personally, I've never even thought to pair my Apple Watch with anything other than my AirPods, so I haven't experienced this. I try to travel with my iPhone as little as possible, using the watch instead. On those instances where the iPhone is in my pocket for whatever reason, yes this a real use case (for me)...maybe not for you. howver I would like to be able to start out a playlist in shuffle mode. Right now my workout playlist starts at the same song when I open it, and then I have to manually turn on shuffle mode and skip to next song. I'm a 25 year  consultant... I know my way around the ecosystem VERY well, and I APPLAUD you for this piece. I have found the implementation of music to be mystifying. I do not subscribe to Music, and don't perceive that I will. I spend a large amount of time on planes and ships that are outside of data reach, or where it is prohibitively slow and expensive... thus, I NEVER want to stream anything! I do, however, have multiple computers, in different locations, so I use iTunes Match on land. Everything, including the watch worked beautifully, until about 2 years ago. At that point, my carefully cultivated playlists meant nothing, and the phone started streaming rather than playing directly... same with the watch, it will only stream from the phone, and I can almost never get it to play directly from the playlist loaded on the watch. Likewise, when I plug the phone into the car, with nothing at all playing... the phone will choose a random track from my entire library, and stream it over cellular, and play it in the car. This, in SPITE of the fact that I have all settings related to Music and streaming set to OFF, and NO cellular. The tracks it picks are so random, and unwanted, too. Look, I have 35 nieces and nephews. My library has some Barney and Sesame Street in it... that DOES NOT mean I want to hear it when they're not present, yet that's all that the phone does. I've spent hours on the phone with Care, and it's always the same line... this is unexpected behavior, and it will be escalated to the next tier - who will (NEVER) call you back. Not once. The music space on both devices has become so unnecessarily obtuse. It fells like they've just said, "hey, we've moved on to streaming... so either do that, or we don't care." Two years ago, there was a simple setting: ONLY use music on my phone. That's gone. I do know that there is now a menu item in the iPhone music app for "Downloaded Only"... but it is not the default, and takes several layers to get to. If I quit the app, that selection is gone, and has to be reselected. The simple system wide setting was the perfect solution, but it's long gone. Likewise, FINDING a song is maddening. I ONLY want to look through the music I have chosen to download to the phone or watch... but you can't do that... it forces you through your entire library! One thing that's bewildered me is attempting to use Siri on Watch to start a song playing on my phone while I'm driving and phone is in shirt pocket. (Only the AM still works in my 2001 Silverado.) Watch wants to know if I want to use AirPods (which are in case in pocket) or pair a new device. So, I can use Siri on phone to start playing song (sometimes) but not use Watch as a remote. First World Problem for sure, but frustrating. In my experience, it it is the car's head unit that makes the requests to a plugged-in iPhone, which they may also recognize as an iPod instead, but in either case use the iPod Music Controls API to request music off the device. ...once you turn Music off from cellular there, it cannot use cellular data. I just use mine to tell the time now as Apple have started to make things to awkward or hard t use. Apple used to be all about ease of use, now they don't care. Take iTunes, its getting worse by the upgrade. If I could find something else to use to store and play my 100s of albums, I'd happily walk away from the Apple Watch and iPhone. Apple products are no longer better than the competition. The S9 is just as good as the XS but half the price. IOS isn't any better than Android these days and as stated before iTunes is now utter crap. BTW I just spent £999 on the iPhone XS for my wife. In the UK you're not allowed to touch your Apple Watch while driving, it comes under the use of mobile devices while driving law. This is great, and touches on several things that have dumbfounded me to the point that I just don't even try to listen to music using my Watch anymore. It's kind of like when my HomePods suddenly start playing music because I said something out loud & I have no idea what they're playing, or why, or from which device or service or library, or even what I said that made them take off. End result is my usage of Apple Music on my mobile devices, especially when they're all gathered at one physical location, is very circumscribed, conservative, and limited to the very simple 'I know that works' kinds of configurations. Thank you for reassuring me that it's not just me. PS Oh btw I'm one of those apple-since-86 people, so it's not exactly like I'm new to this, either. If your comment has been deleted twice now, feel free to read the commenting guidelines conveniently linked at the bottom of every page to discover the reason why. Authors can be reached by clicking on their bylines on the main page. What bewilders me @king editor the grate is why you would interact with an Apple Watch when you are in control of a motor vehicle. A child runs out onto the street in a neighbourhood chasing a ball ... the 2 seconds that could have been used to react is instead squandered and everyone's life changes in an instant. The music space on both devices has become so unnecessarily obtuse. Apple music space summarised in 11 words. Another great and relevant article, guys! I hate when outside mowing the grass, confident my AirPods are receiving music from the watch and I break to get something from the garage. This damn watch sniffs out the WiFi and iPhone and switches. Then I walk right back out to the mower and the music stops! So I fight with the damn thing to get it playing from the lists/songs I purposely put on it (at the agonizingly slow transfer process that takes overnight to handle anything more than a couple dozen song changes). You nailed it, the only easy thing is AirPod linkage. Beyond that the experience is, well, typical make-and-ship-it Tim Cook Apple, Inc. The days of Jobs are so much missed!!! If you are phoneless, an active cellular plan (cellular Watch required) is the only alternative to get music bits on the Watch (as you are “phoneless”, remember). Initially the article implies “eating up your cell data”. As best I know, all cellular plans for the Watch are unlimited data. The concern would be with battery drain, not the drain on an unlimited Watch data plan, yes? I have an Audi A4 with car play and I experience something similar on random basis. I haven't been able to figure out any pattern or when or why, but sometimes when I plug my phone in it will start playing the last podcast I was listening to, sometimes something else, most of the time it doesn't play anything. Another odd behavior is it will sometimes connect and bring up the CarPlay screen on the car's display, but when I play an audio track, the sound comes out of the iPhone's speakers rather than the car's speakers. I have to disconnect, wait a minute, then reconnect. I have no idea if this is an issue with the Audi firmware or with the CarPlay software in iOS. When you have two systems from different manufacturers that have issues it's often frustrating figuring out where the glitches lie. Settings > Cellular > [scroll down to Music] > off...once you turn Music off from cellular there, it cannot use cellular data. Ahh... but it does. I know quite well the songs that are in my playlists on my phone, and with great certainty, some that are not. For example, I downloaded a bunch of Hawaiian songs for a luau themed party we had 10 years ago. I paid for them, so I'm not deleting them from my library. I know they exist. I also know for absolute CERTAIN that they are NOT present on my phone, or in any playlist. ALL settings related to streaming of music are OFF (as I originally said)... yet, if I connect this phone in my sister-in-law's Ford Escape, we're dancing the hula within a minute. I'm VERY well aware that it should NOT be behaving this way... but it is. As I said in my original post, I've spent HOURS on the phone with Care, they hear the behavior, and even see the behavior through phone screen sharing... they ALWAYS say it will be escalated to engineering, and I'll get a call back... there has NEVER been a call back. Not once. I have similar problems with the watch. It is SO HARD to get it just the shuffle the ONLY playlist I have on the watch. If I'm playing from the watch, it's to work out. If I'm working out, I ONLY want the one playlist. If I walk close enough to the locker room in the gym, that has my phone in the pocket of my jeans... out of nowhere, I've got some totally random song that is not only NOT on the watch playlist, but not on ANY playlist on my phone!